March 16 and 22, 2017. Tatiana Bilbao was born in Mexico City and graduated from Architecture and Urbanism at Universidad Iberoamericana in 1996. 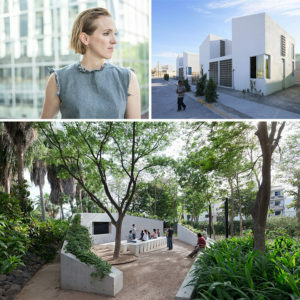 From 1998 to 1999, she served as Advisor for Urban Projects at the Urban Housing and Development Department of Mexico City. In 2004 she founded Tatiana Bilbao ESTUDIO with projects in China, Europe, and Mexico. Tatiana was named as an Emerging Voice by the Architecture League of NY in 2010 and received a Kunstpreise Berlin 2012 by the Akademie der Künste. In 2014 she received the Global Award for Sustainable Architecture by the LOCUS Foundation, Cité de l´Architecture of Paris and patronage of UNESCO. Her work is part of the collection of the Centre George Pompidou, the Carnegie Museum of Art, and the Art Institute of Chicago. The multicultural and multidisciplinary office of Tatiana Bilbao attempts to understand places that surround us in order to translate rigid codes into architecture. The office regenerates spaces, humanizing them as a reaction to global capitalism and opening up niches for cultural and economic development. Tatiana Bilbao ESTUDIO’s work includes a Botanical Garden, a master plan and open chapel for a Pilgrimage Route, a Biotechnological Center for a Tech Institution, a house built with 8,000 USD, and a Funeral Home. The work has been published in A+U, Domus, and The New York Times, among others.